The Waveswinger premiered in Germany in 1972 as a park model designed by Zierer, built by Franz Schwarzkopf (older brother of Anton). In 1974 the first transportable Wellenflug (as it is known in its home country of Germany) premiered under the same partnership. Since this time there have been over 150 units exported worldwide by Zierer who later went on to be the Waveswinger’s sole manufacturer. As the name suggests, the ride moves in an oscillating wave-like motion. Tilting at its peak, the carousel rises telescopically flinging riders of young and old into the cool breeze at 30km/h (10 rpm). 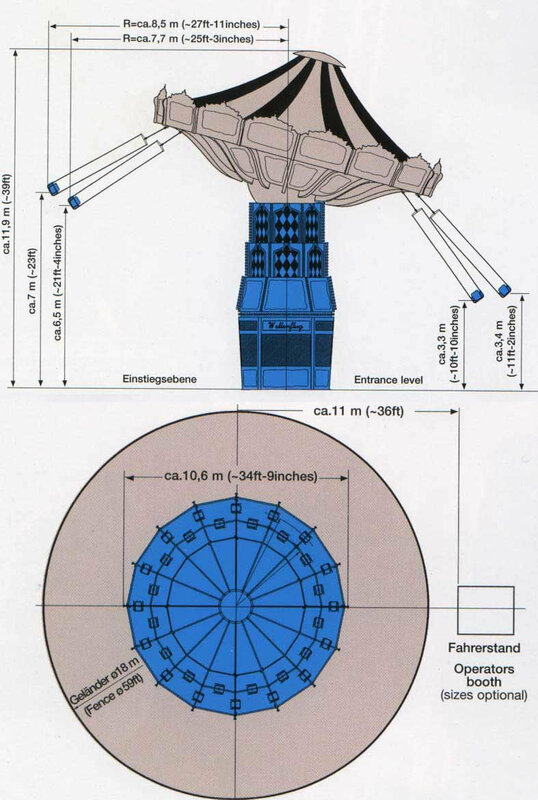 The rotating top is raised via 4 sets of cables linked to a hydraulic ram inside the central column. The ram then retracts to pull the cables that hold the centre ring (and attached carousel) upwards; eventually tilting over a curve in top of the central pole, which rotates in the opposite direction to create its unique motion. (this moving centre-pole remains ingeniously hidden under the decorative panelling) The carousel is rotated by 2 motors in the roof, while 2 motors in the base turn the curved centre pole in the opposite direction. The Waveswinger’s popularity continues into the 21st century with Zierer offering five different sized units for 24, 32, 40, 48 and 64 persons, all decorated with the hand-painted Bavarian scenery that riders and owners world over have come to love.